I Let The Kid Do My Makeup. Inspired by this post over at Forever Amber where she let her husband do her makeup I tought it would be a fun idea to let my nine-year old step-daughter do mine and then blog about it. 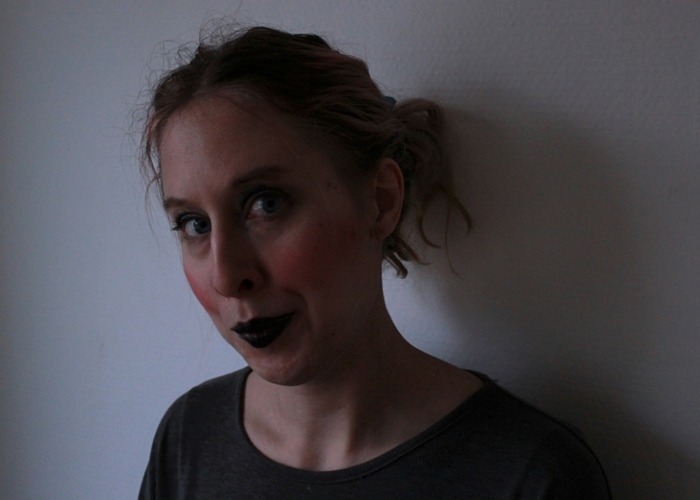 But then life came in-between and I kind of forgot about the idea until yesterday when Little Miss I (a.k.a the kid) thought I was a real bore when I wouldn’t let her do my makeup for yesterdays outfit post. 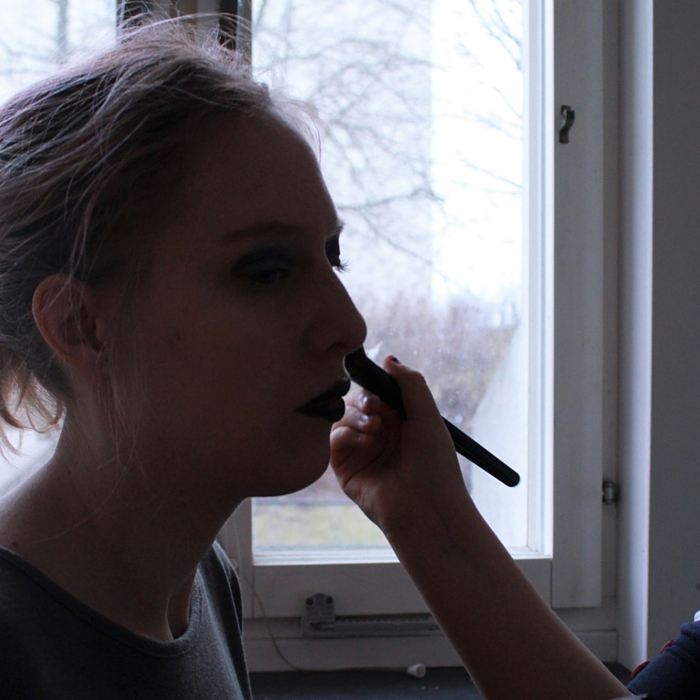 So then I saw it fit to let her do my makeup today, since I wasn’t going outside anyway, and then blog about itas planed . 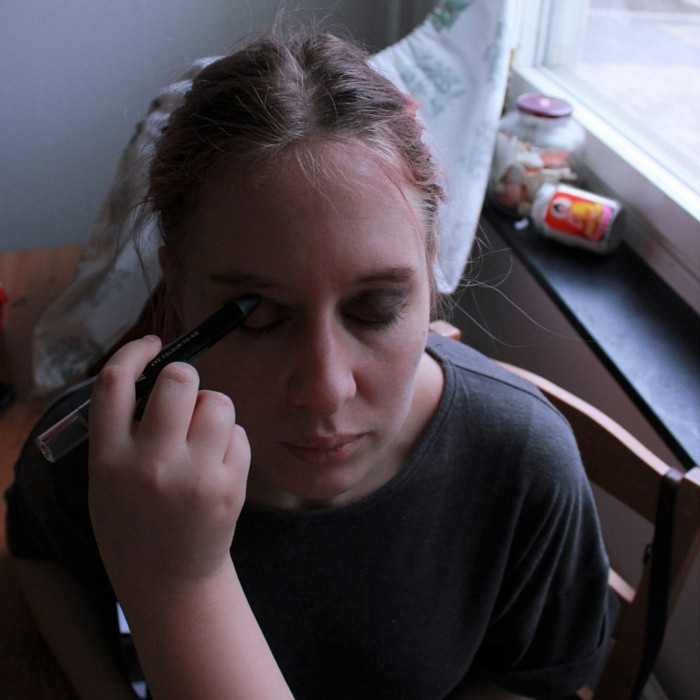 So here we go, this is how it looks when I let the kid do my makeup. The pictures are pretty dark and the ones I use is some of the lightest ones but I didn’t want to re-do the whole thing since I feel that it would kind of take away a bit of the point of it. I gave her some direction by telling her what the different products were used for and in what order I use to apply them. I got a lot of consealer around my nose but not nearly enough under my eyes. After that she applied powder on at least two-thirds of my face. While she did give my eyebrows some color she did not shape them what so ever, nor did she draw them on only in the direction of the hairs. She was very focused on the eyeshadow and said that she had seen how to do it on YouTube. She also did very well with the mascara and didn’t even poke me in the eye once. When it comes to the blush she chose the pinkest one I own that I don’t normally wear and started applying it in big circles on one of my cheeks and then went on to doing upward strokes on the other one. She them proceeded by adding some to my nose saying that that’s how it should be done. Like you can se she also choose to use my black lipstick, this after going through at least five others but considered them to boring. I Let The Kid Do My Makeup, the result you have all been waiting for. What do I think of the result? Well I guess it is true that too much makeup can make you look older, or maybe that the wrong makeup can make you look a bit like a crazy person. And I’m actually surprised that I didn’t end up with a heart or something like that in on my forehead considering the amount of My Little Pony tutorials she has been watching. Will I let her do my makeup again? Yes because it was a really fun thing to do. So what do you think about this short eyebrows and too much blush look? Please leave a comment to let me know. ← Just Another Slip Dress And A Tiara.